We love to had a really good laugh in the bedroom when we prepare and record for one of our weekly podcasts. 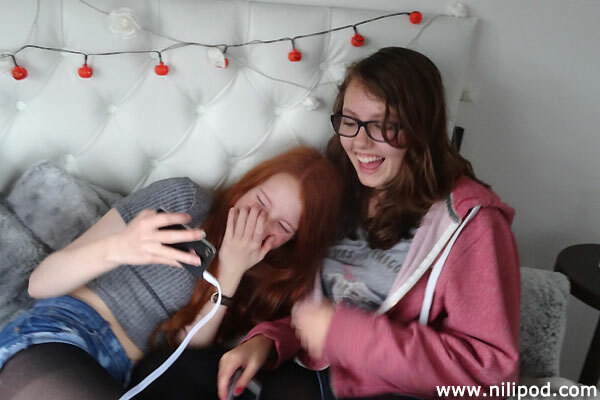 This photo shows Nia giggling like mad with her hand over her face, while Liv is also in fits of laughter looking at something extremely funny on the iPhone, probably YouTube. It is hard to imagine life without online videos, which is why we set up our popular feature 'YouTube Video of the Week. And of course, this means that we have to do lots and lots of research to find the very best ones to play out and talk about on the show. Please let us know if you spot any particularly funny ones that you'd like to share with us.